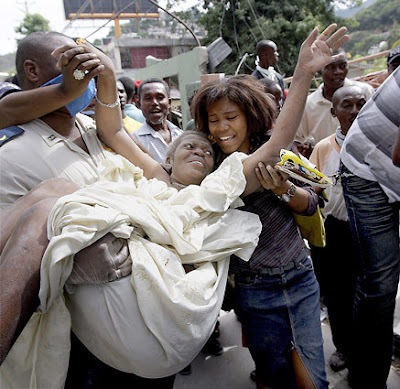 Amid the catastrophe: Smiles of joy and celebration when Gladys Louis Jeune is pulled from the rubble of her home in Port-au-Prince (AP photo/Patrick Farrell). Tonight, January 19: Queen Anne restaurant siblings Crow (823 Fifth Ave. N., 206-283-8800) and Betty (1507 Queen Anne Ave. N., 206-352-3773) will donate all of this evening’s profits to Doctors Without Borders. Call for reservations. Thursday, January 21: Coastal Kitchen (429 15th Avenue. E.), serving breakfast, lunch and dinner on Capitol Hill, will donate 25 percent of the day’s sales to Mercy Corps. In addition, a Mercy Corps volunteer will be on hand to receive any additional donations and discuss the organizations’ relief efforts. Open 8 a.m.-10 p.m.
Thursday, January 21: Pho Saigon (1016 Madison St.) on First Hill will donate the entire day’s proceeds (and gratuities) to the efforts of Dr. Kathleen Jobe who, along with a the Seattle/King County Disaster Team, will soon be traveling to Haiti to set up a medical clinic providing emergency aid. Sunday, January 24: Dinette (1514 E. Olive Way) on Capitol Hill will donate a portion of sales ($40 per person) from this week’s Tuscan-inspired Sunday Supper to NetHope. With only 40 seats for this family-style meal, reservations are going fast and available via e-mail by contacting Dinette@mail.vresp.com. Monday, January 25: Iron Chef contender Daisley Gordon and Campagne in Pike Place Market (86 Pine St., Seattle; 206-728-2800) will offer a special 3-course Bouillabaisse Dinner comprising a traditional Provencal-style seafood stew, chevre salade and a galette for dessert. Sommelier Cyril Frechier is pouring wines. All proceeds ($100 per person) will be donated to Medecins Sans Frontieres (that’s French for Doctors Without Borders). Note: Campagne’s purveyors are donating products for the dinner, service staff is donating labor and gratuities, and the Inn at the Market (bless ’em!) has offered to match the first $5000 raised by the restaurant.